Eric is the new kid in seventh grade. Griffin wants to be his friend. When you’re new in town, it’s hard to know who to hang out with—and who to avoid. Griffin seems cool, confident, and popular. But something isn’t right about Griffin. He always seems to be in the middle of bad things. And if Griffin doesn't like you, you’d better watch your back. There might be a target on it. As Eric gets drawn deeper into Griffin’s dark world, he begins to see the truth about Griffin: He’s a liar, a bully, a thief. Eric wants to break away, do the right thing. But in one shocking moment, he goes from being a bystander . . . to the bully’s next victim. Bystander by James Preller came to my reading pile in an interesting way. As some of you may know, I have my B.S. in English Education. Due to that little fact, I was contacted by my mother's principal to help develop comprehension questions for an anti-bullying program the school was starting in light of all the bullying problems. Bystander was one of the books on the list. The book tells the story of A 7th grader named Eric. He's new in town, and is still trying to get his footing. The day before the first day of school he meets Griffin, a charismatic boy who everyone loves. Griffin befriends Eric, but as their relationship grows the facade disappears, revealing the bully underneath. Unfortunately, Griffin is one of the worst kinds of bullies: the golden child who has all the adults fooled. Pressler writes such a realistic look at bullying, the "not bully" bully, and the bystander. Eric is that bystander for much of the book. He watches Griffin terrorize kids and at one point the thought "At Least its not me" flows through his mind. that is real. This clearly shows the conflict that many kids go through. The flip-flop between wanting to help the victim and not wanting to become the victim is a tough place to be. I've noticed that many people who have read this book have not liked the ending . I can see why; we, as a people, love a happy, tied-up ending where the hero triumphs and the villain is punished. Well, unfortunately, that is not how the real world works. The situation Preller presents between Eric and Griffin is realistic; the boys settle the bullying themselves, and the book ends without any adult-dealt punishment. The ending is what, for me, makes Bystander a good book. I would recommend parents and teachers read this book with their children or students, as it is a nice jumping off point to the discussion of such a scary epidemic such as bullying. A really great discussion guide is included in the back of the paperback edition (I'm not sure if it's in the hardcover), and an author interview is also included. 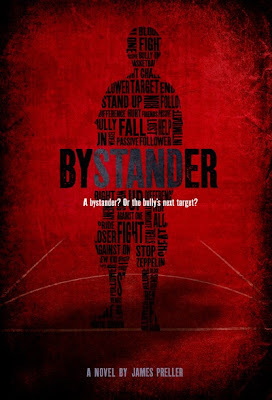 Please check out Bystander by James Preller today! i've never heard of this one! thanks!